Mary Booth and I met at a Slow Food Austin potluck several years ago. I made these tartlets because at the time I was hoping to launch a commercial endeavor selling lemon curd. Mary was on the Slow Food Board and an enthusiastic supporter of local farms and food. Because of health issues, she told me she could not taste many foods but somehow she was able to taste the tart sweetness of the curd. Every time I saw Mary after that I was greeted with a big smile and introduced as the Lemon Curd Lady. Mary passed away this last July, so this holiday season I have renamed my tarts in her memory. The Austin food community misses you, Mary! The curd that Mary loved so much was made with eggs from Boggy Creek farms. With so few ingredients, it is very important to use the best ones possible. If you have never had farm fresh eggs, get your tail-feathers down to the local farmers market and pick up a dozen. 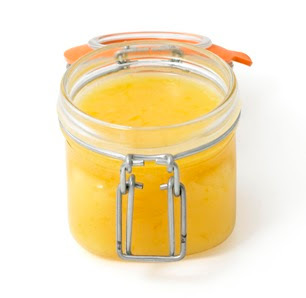 You will be amazed by the intense color and flavor of the yolks which showcase nicely in this curd. Add the zest to the sugar and set aside, preferably overnight but at least an hour in advance. Check my post about the virtues of keeping a supply of lemon sugar on hand in your kitchen at all times! Add enough water to a medium saucepan to come about 1-inch up the side. Bring to a simmer over medium-high heat. Meanwhile, combine egg yolks and sugar in a medium size metal bowl and whisk until smooth, about 1 minute. Measure citrus juice and if needed, add enough cold water to reach 2/3 cup. Add juice to egg mixture and whisk smooth. Once water reaches a simmer, reduce heat to low and place bowl on top of saucepan. (Bowl should be large enough to fit on top of saucepan without touching the water.) Whisk until thickened, approximately 8 minutes, or until mixture is light yellow and coats the back of a spoon. (UPDATE- A friend of mine recommended I add to the description of the thickness. As you whisk the curd, you should be able to see the tracks of the whisk and the curd should be thick enough to stand up on a plate. It will thicken more as it cools but if you don’t cook it long enough, it will be soupy.) Remove promptly from heat and stir in butter a piece at a time, allowing each addition to melt before adding the next. If you have any eggy bits or wish to strain out the zest you can. Personally I prefer the texture with the zest. Remove to a clean container and cover by laying a layer of plastic wrap directly on the surface of the curd. Refrigerate for up to 2 weeks. Phyllo dough can be a challenge to work with. The most important things to know are that it should be gently thawed in your refrigerator at least 1 day before you plan to use it and that it dries out very quickly, so as you remove a sheet, cover the stack of sheets you are not working with immediately with a piece of plastic wrap and a damp cloth. Do not let the damp cloth touch the sheets or you will end up with a gummy mess. On a clean surface lay 1 sheet of phyllo, lightly spread melted butter over entire surface with a pastry brush and sprinkle lightly (approximately 1/2 teaspoon sugar) over buttered surface. Lay another layer of phyllo on top and repeat melted butter and sprinkling of sugar. Repeat phyllo/butter/ sugar for a total of 3 layers. Lightly spray a muffin tin (mini or standard size) Cut dough in squares a inch or so wider that the muffin cups. (Dough squares will form a fluted-edge tart.) Place the dough in the tins, pressing carefully so that the dough fits snugly in the cups. Brush with butter and bake at 400 degrees for 5-10 minutes or until light golden color. Fill with curd. Garnish tarts with fresh berries or candied lemon zest. Makes approximately 40 3 inch tarts. My absolute favorite kitchen tool is my microplane zester. There is something soothing about zesting then juicing a big pile of fragrant lemons. Do not use your zester right side up as in this picture. Turn it the other way and pass it over the lemon like you are shaving it. The zest will collect in the microplane and it makes it a lot easier and neater to transfer the zest to the bowl. I can do about half a lemon before it almost fills the back of the zester. Dump the zest that has collected and finish zesting the fruit. If you try to collect too much zest in the microplane at once it will spill and cause a mess. Now what should you do with all of this zest? I say make lemon sugar! Add the zest of 2 lemons to 4 cups of sugar, turbinado or raw cane work great but regular table sugar is fine. Seal it up and let it sit at least overnight. The fragrant sugar is great sprinkled over fruit for a quick fruit salad, as a substitute for regular sugar in your favorite cookie recipe, used as a topping for baked goods, and absolutely delicious in tea- iced or hot.